Fabricators looking to improve their CNC punching need only look beyond what they’re doing now. Chances are, tools and techniques already available are worth checking out. Start with these tools, their uses and surprising capabilities. 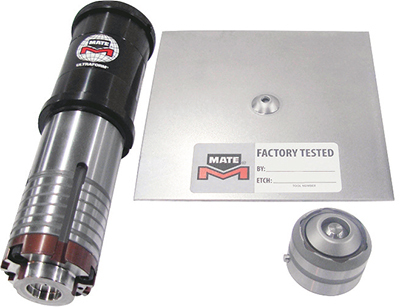 Frequently, fabricators use special tools in a CNC punch press’ auto-index station to round corners on parts. Rounded edges often are preferred because they provide a finished appearance and eliminate injury-causing sharp, pointed corners. A four-way radius tool allows fabricators to achieve rounded corners with just one hit instead of rougher nibbling methods. Also, the tool operates well in either a single-station or a multitool setup. Fig. 1—This four-way radius tool rounds corners with a single hit, versus many hits required with a nibbling tool. Fig. 2—Slitting operations are best performed with fully guided tooling. The punch point should enter the center of the die to deliver the best edge quality while reducing tool and machine wear. 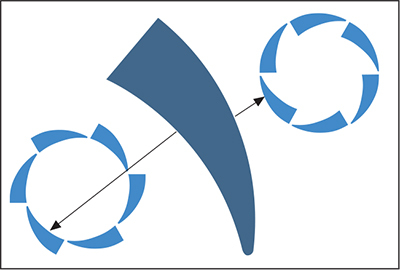 To further streamline operations, the design of a four-way radius tool (Fig. 1) can be matched to the width of a slitting tool. This allows for combining these tasks in parting operations. In a continuous parting application, where parts are spaced across the width of the parting tool, the four-way radius tool uses one hit to create a corner radius on four parts. This allows greater sheet utilization and optimizes the number of parts nested in the sheet. In addition, a four-way radius tool does not require the use of an index station. For example, given a sheet of 100 parts (10 rows by 10 columns), a fabricator can punch the corners with 121 hits with the one tool versus 400 hits with a special tool in the index station. Fig. 3—Prepunched forms are preserved when follow-up blanking is performed with a custom blanking tool. Because slitting tools form the backbone of most punching processes, pay attention to their condition. Used and abused, slitting tools must survive partial hits, unbalanced punching loads and high-speed operation while punching a range of materials. Slitting-tool life is extended when the punch travels into the center of the die. This requires the press to be in good operating condition with precise alignment. Wear patterns in the punch and die indicate angular misalignment in the press—it may not be in acceptable operating condition. For long slitting operations, use fully guided slitting tools, especially during partial hits. These securely and precisely position the punch points so they enter the centers of the dies (Fig. 2). This allows the press to operate at high speed with good part quality. Also pay attention to the tool’s punching-force calculation, ensuring it is correct for the material being punched. As tools become dull, punching force increases, which wears the tooling and the press. It is best to limit the punching force for a particular slitting tool to 80 percent of press capacity. Fig. 4—Punch forms, such as this embossed feature using both the A- and B-station, can expand the range of a punch press. Tabs, embosses and other small forms often are formed ahead of being punched or blanked from the sheet material. When blanking occurs, these small forms often are damaged or destroyed, wasting material and press time. A custom tool with reliefs allows prepunched forms to be included in the part, preventing damage to the forms (Fig. 3). The small forms may be placed directly in the sheetmetal prior to part blanking. This allows processing of small forms in the press rather than in a secondary operation. Including a relief in the tooling allows forms to enter the relieved area of the tool during blanking. Large areas can be relieved to accommodate multiple forms for a part or an area specific to a particular form. Overall, good-quality blanks depend on part size, die clearance, height, length and width of part forms as well as location of the part. 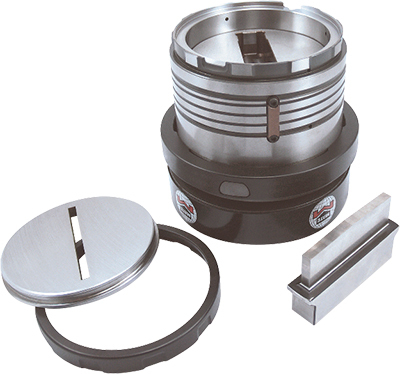 Punches should be flat using straight taper dies. As always, quality punching requires sharp punches and dies. Fig. 5—An inside/outside radius tool is ideal for punching a large radius. Such tools punch higher-quality edges with fewer strokes than smaller nibbling tools. Due to a limited number of press stations, production challenges occur when stations fill. To expand the forming capacity of a CNC punch press, consider using the A-station as well as the B-station (Fig. 4). Fabricators most often use the B-station for forms such as louvers, knockouts and embosses. The following tools find possible use in the thick-turret A-station: centerpoint up-form and down-form, countersink up-form and down-form, emboss, extrusion down-form, shearbutton, and V-line stencil for logos and symbols. Using these forming tools in the A-station expands the punching range of the press, reduces tooling setups and increases punching output. Most presses feature an auto-index station that can be used effectively to punch large contours in a part. 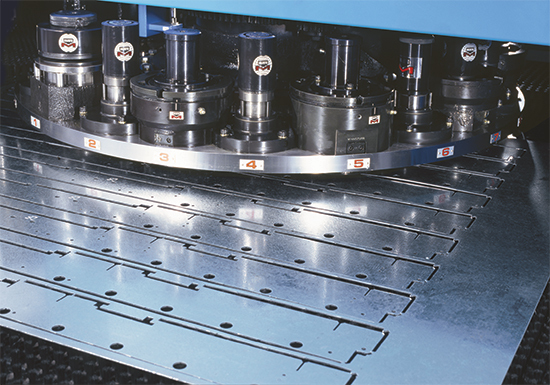 Using special shape punches and dies, the auto-index station can be rotated from the machine program to any designated angle, creating the desired contour. This proves far more efficient and produces better edge quality than nibbling large holes with a small punch. It also eliminates multiple strokes using small punches that create excess punching debris, tooling and machine wear (Fig. 5). Three shaped tools in particular can provide more efficient contour punching. Quad radius tools produce large holes with smooth edges, and inside/ outside radius tools retain punch slugs or parts in the sheet. Banana tools, similar to inside/outside radius tools, offer the added benefit of using the inner part of the tool to nest smaller parts. Also, unlike inside/outside radius tools with sharp points that can break, obround banana tools may be more effective in thicker material. 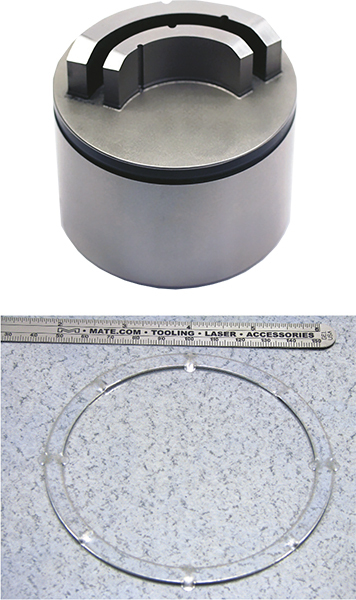 To achieve knockouts larger than the presumed capability of the punch press, use a segmented knockout tool (Figs. 6-7). These knockouts won’t be as ‘pretty’ as those formed by a standard knockout tool, but they do the job in many applications. These tools position knockout tabs at specific locations to facilitate slug removal. A variation of the segmented knockout is the arch-bridge lance and form tool, with each edge of the arch chamfered to help overlap the hits and minimize distortion. Employing either tool for larger knockouts uses less tonnage than standard tools on smaller knockouts, thus reducing machine wear. Another knockout technique for minimizing machine wear: use of down-forming. It produces a larger footprint without requiring increased press tonnage. In contrast, up-forming requires a spring stripper and additional force. Fig. 8—Always a problem, burrs on parts can be removed using a rollerball tool (shown) or straightline deburring tool. 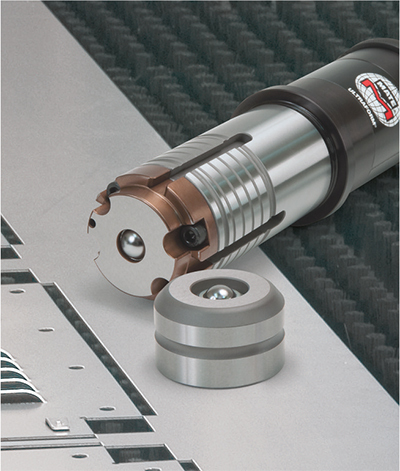 The rollerball deburr tool is designed for thick-turret and Trumpf-style presses. 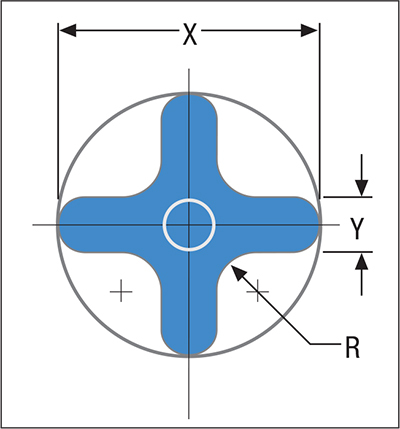 This tool, operating in the x and y axes of the press with the ram down, pushes the burr away and creates a radius on the side of the part (Fig. 8). Using a special ball in the upper and lower part of the tool, all part contours can be processed, including small corners. The straightline deburr tool deburrs in a straight line as well as through tight corners, and is used in an auto index station or as two tools set at 90-deg. angles to each other. It utilizes a raised area on the die, angled at 20 deg., and coins the burr back into the material’s fracture area. The 20-deg. angle helps prevent sideways movement of the material or parts. 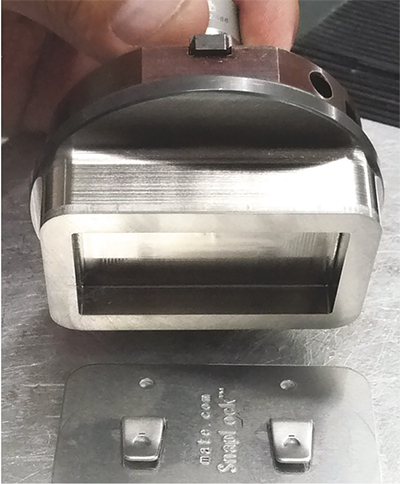 While not material-thickness-specific, the straightline deburr tool is parting-tool-specific, and should be designed for use with a specific-width parting tool when immediately deburring adjacent parts. It also can be used to deburr a single side or the interior of a rectangular opening.